Saturday, March 7th, Aquarium Drunkard presents Lambchop at the new Largo – at the Coronet – with special guests Radar Bros. This is a pretty incredible bill, and it’s not all too often that the collective actually makes it to the West coast; in fact one is more likely to see them perform in Europe. Radar Bros. new-ish lineup sound great (saw them at Spaceland last week) and, who knows, they may premiere some of the new, as of yet, unreleased stuff their presently working on. We have three pairs of tickets for AD readers. To land a pair, leave your name, a valid email address, and your favorite Kurt Wagner penned tune. 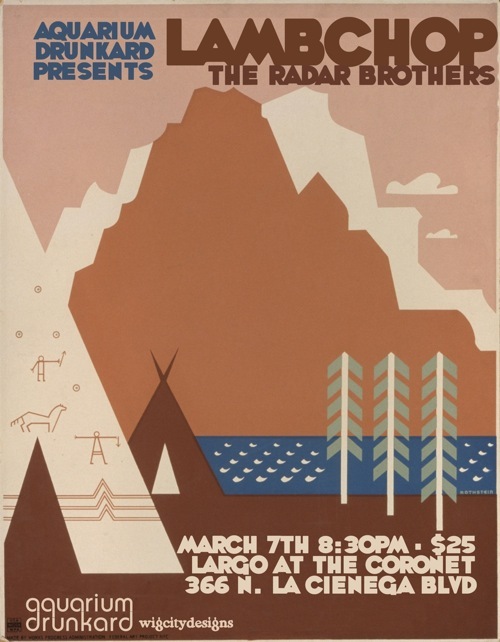 Posted on February 25, 2009 March 3, 2009 Aquarium Drunkard Presents Lambchop Radar Bros.
I’m partial to “all smiles and mariachi” from way back when I quit smoking. “it’s not alright” is great, great, great. “Nashville Parent” is my fave. I bought “Nixon” on a whim years ago, mostly because I loved the cover, and that song was the one that pulled me in. “National Talk Like a Pirate Day,” however, might be the best one Kurt’s ever written. A ridiculous conceit made heartbreaking — that’s what Lambchop does best. I’d love a pair of tickets. I’m gravenblackheart at yahoo. Love your site, and if it’s possible, I love your Sirius XM show even more!